You can use comments to discuss your content. You can make comments directly on text and assets, and a record of the thread will be kept in the comment history. 1. Highlight some text on the item and select the comment bubble icon from the formatting toolbar that appears. 2. Write your comment and press 'Send'. 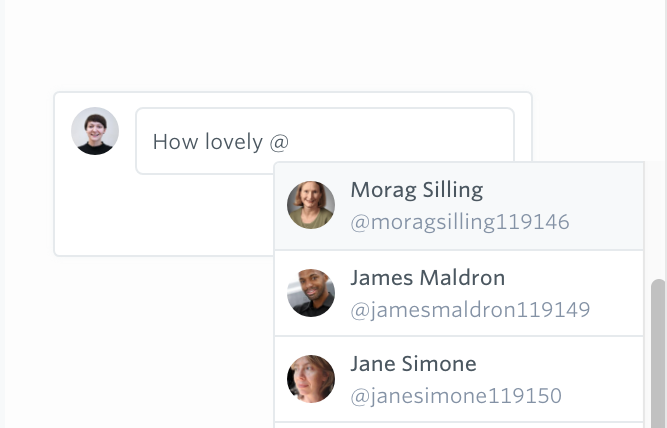 If you want to notify one of the team, you can type '@' to select a colleague from the list. Your comment will now be visible on the item for your team to see. People can reply to your comment by clicking on it on the item, entering their comment into the comments box and pressing 'Send'. 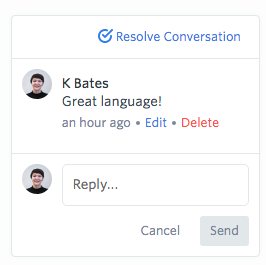 Comments will be grouped together as part of a conversation. If it's a long conversation, you'll notice that GatherContent shows the earliest message, and the latest as a summary. Click the conversation to see all comments in full. 1. Upload the asset to an asset field on the item's structure or template. 2. Hover over the asset and click the comment bubble icon. 3. Write your comment and press 'Send'. You can edit or delete an existing comment from an item if you made the original comment. 1. Click the comment you want to edit or delete. Click 'Edit' and edit the comment from the text box. Click 'Delete' and then confirm by clicking 'Delete comment'. You can't edit or delete a comment made by someone else. Tip: You can delete the entire conversation at once by clicking the first comment in the conversation, and clicking 'Delete', and then 'Delete thread'. 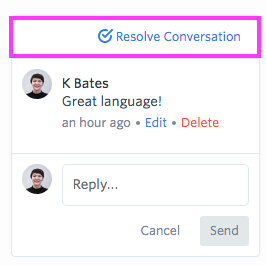 If a conversation (a group of comments) has come to a natural end, you can resolve the conversation to remove it from the item. You can always view previously resolved conversations from the comment history. 1. On the item, click the conversation you wish to resolve. 2. At the top, click 'Resolve conversation'. The comment history shows the conversations that have taken place on this item. 1. To view the comment history, click the Settings menu at the top right of the item. 2. 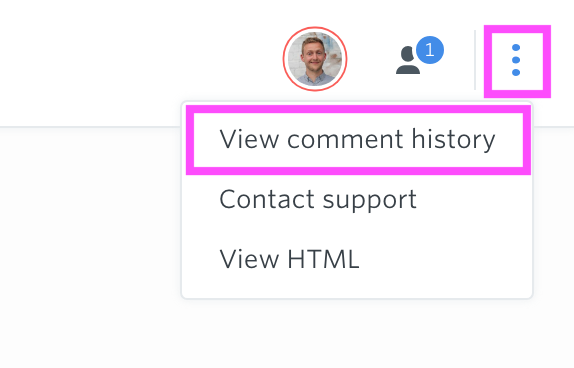 From the list, select 'View comment history'. 3. You'll see the comment history, where you can see all comments on this item. The comments are attached to the content which they were made on, and the field title is shown for reference. There are tabs at the top, so you can choose to see resolved, unresolved or all comments. Click the back arrow to go back to editing the item. #1: You can quickly see which items have new comments on them by going to the Content tab and looking for a blue comment bubble icon on items. #2: You can also add comments to all text fields, including rich and plain text, assets and items that are in 'Read-only' mode.